Are you looking for a single serve coffee maker? We have done extensive research to bring you more information about the Keurig K15. As always, you can rely on Keurig to deliver the most innovative features and the widest range of brands and flavours of coffee, tea and hot chocolate. 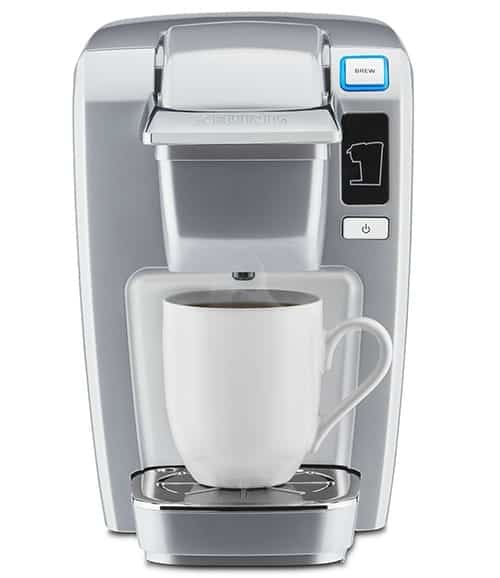 Read on to find out more about the Keurig K1﻿5. How Does the Keurig K15 Work? Who is ﻿﻿The K15 Perfect for? Who Should Avoid the Keurig K15? Simple huh? Each cup takes around two minutes to brew as the water has to heat each time you use the machine. Although the manufacturer states this machine is only compatible with K-cup pods, actually most pods will fit this machine, so you don’t have to spend a fortune on over priced pods. However, if you use non-recommended pods and there is a problem with the machine, you won’t be covered by your warranty. Who is The K15 Perfect for? The Keurig K15 is perfect for anyone who wants good coffee on the go. If you travel a lot, especially in a caravan or camper van, this machine is for you. The lack of a water tank makes it super light weight and the small, compact design won’t over crowd your available space. It’s also a good fit for anyone who won’t be using the machine a lot. If you’re a once a week kind of coffee person, then this machine will more than cover your needs without having to spend a fortune. The lack of water tank also means you won’t forget to empty it between uses and end up with a tank full of smelly, stagnant water! Really, this machine is a travel product. It isn’t the ideal choice for an in home coffee maker unless you will only be using it on very rare occasion. The long brewing time and constant refilling mean it isn’t a machine for a family who want two or three cups a day and multiple cups at a time. Overall, the Keurig K15 is a great little compact model. If you want a light weight machine to take anywhere with you, this is the one! My daughter-law and I love my Kuerig K15. I just need top know how to get another reusable capsule. I made a mistakes and tossed mine.